Start Blogging with a Bang! B2B companies that blog get 67% more leads per month than those who don't. And 57% of businesses report they have acquired a new customer through their company blog! Got a business blog? If you do, that's awesome! The next step is to ask yourself if that blog is making the contributions to your business that you had expected. And if you don't have one, well it's absolutely never too late to get started! 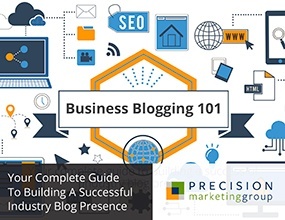 Real B2B business blogging success stories... and more. So what are you waiting for? Get noticed in your industry. Build trust with your prospects. And start blogging with a bang! Simply fill out the form to get your free eBook now – Piece of cake!